Honey Cocaine is a cambodian rapper, representing Toronto, Canada. Honey Cocaine is the first artist signed to Tyga's record label, Last Kings. She was discovered by Tyga on Youtube and then not to long after signed to his label. Honey Cocaine since then has dropped "F*$k Your Feelings Vol. 1" & "90's Gold"Mixtapes. She just recently got off the "Careless World Tour" and now she's on her own tour, The Group Hug Tour. 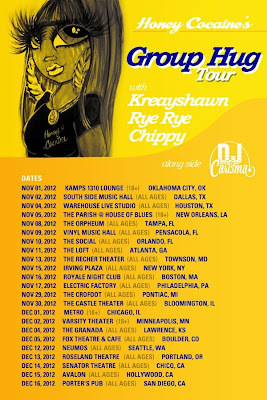 The Group Hug tour started Nov. 1 featuring Kreayshawn, Rye Rye, Chippy and Dj Carisma.